Grenada is the ideal Caribbean getaway… white sandy beaches, luscious palm trees, cloudless blue skies and more! 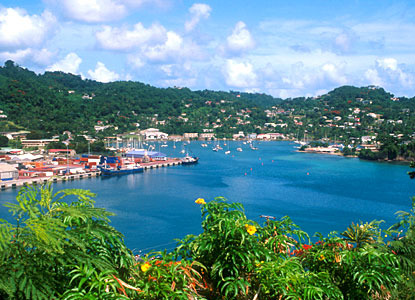 If you’re after a holiday destination that can totally relax and unwind you then look no further than gorgeous Grenada. This small island is also much less touristy then its Caribbean counterparts so it’s the ideal place for a quiet holiday. Not only this, but Grenada boasts a laidback, chilled lifestyle that will ensure you never want to leave! Even though Grenada is a relatively small island, measuring only 22 miles by 12 miles, it is certainly not lacking in beautiful beaches that will take your breath away. You really are spoilt for choice here. Grand Anse is just one of many beaches that proves popular amongst tourists for it’s crystal clear turquoise waters and appealing golden sand. Or for something a little different, why not have a peek at Black Bay. The name is not at all figurative for the sand on this beach really is a smooth and soft opaque black. Or if you want to inject a bit of excitement into your beach day, head to Molinare Reefs, where you can dive all day long. What more can Grenada offer? Grenada may tick all the boxes and more for the conventional holiday full of sun, sea and sand, yet this small island can also offer much, much more. Grenada is a haven of natural beauty, waiting for you to discover it! If you’re after a fun filled day, Grenada has plenty of things on offer. Take a trip to the Grand Etang national Park where you can spend as many hours as you like hiking and trekking through the dense rainforest. Here you can experience everything from the giant gommier trees and tropical flowers to the beautiful hummingbird and cheeky Mona monkey. If constant days of lying in the sun doesn’t sound too appealing, why not break it up a little and take a trip to Grenada’s isle of spice, where wonderful waterfalls are everywhere to be seen. A must see is the Concord Falls where the water is beautifully transparent and refreshingly ice cold. After a day spent doing all the things Grenada can offer, it only gets better! Take yourself down to the quaint town of St George, which boasts magnificent views of the Caribbean seafront. Here, you can spend a few hours appreciating the striking views or if you still have a little energy left to exert, take a look around the lovely little town. There are brightly coloured homes, an ancient fort and a beautiful harbour which can occupy your time. Not only this but there is plenty of activity occurring, with lots of busy spice markets! As it is situated in the Caribbean, Grenada experiences a tropical climate all year round. The rainy period is June through to November, in which tropical storms aren’t uncommon. However, the months outside of this period experience 7 to 8 hours of lovely sunshine per day! The fascinating beauty of this island coupled with our cheap offers transporting you there, must make you ask yourself ‘What am I waiting for’? Have a look now at our low cost offers to Grenada and we can take you to this Caribbean heaven.